A nifty iPhone feature is the capability to upload a photo or video directly from the phone’s Photos app or Camera Roll to a MobileMe gallery. The iPhone grabs your MobileMe login info from Mail, so you don’t even have to remember your account password. But there’s one hitch: If you’ve got more than one MobileMe account set up in Mail on your iPhone—for example, I have my personal account as well as a “family” account I share with other family members—there’s no way to choose which account is used to publish media. The iPhone picks one, and if it’s not the account you want, you’re stuck. My iPhone decided to publish my photos and videos to our family account, when I really wanted to post them to my personal MobileMe gallery. In iTunes, enable Mail-account syncing between your Mac and your iPhone if it isn't already enabled: With your iPhone connected, select the phone in iTunes's source list on the left, click on the Info tab, and then check the box next to Sync Selected Mail Accounts. (If you don’t use Mail on your Mac, that’s OK; turn on the feature anyway. If there are non-MobileMe e-mail accounts you don't want to sync, uncheck them.) Then sync. On the iPhone, upload a photo or movie to MobileMe, via the Photos app or Camera Roll, to confirm that it’s uploaded using the desired MobileMe account. Use iTunes—not the Settings app on the phone—to add your other MobileMe account(s) back to the phone: Enable Sync Selected Mail Accounts in iTunes’s Info tab, check the boxes next to the desired accounts, and then sync. (Optional) You can disable e-mail-account syncing in iTunes. This won’t remove the synced accounts from the iPhone. 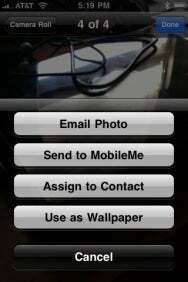 Now when you upload media to MobileMe, the phone will use the desired account. A kludgy solution? You bet. Hopefully a future iPhone software update will add a simple setting for choosing which account to use. *One caveat for Step 2: If you’ve changed your MobileMe account settings in order to save or file messages on the phone, rather than on the MobileMe servers, you should move those messages to the MobileMe servers before deleting the accounts from the iPhone.